The Red Lobster restaurant is known for its signature cheddar biscuits, creamy clam chowder, and delicious seafood dishes of all types. 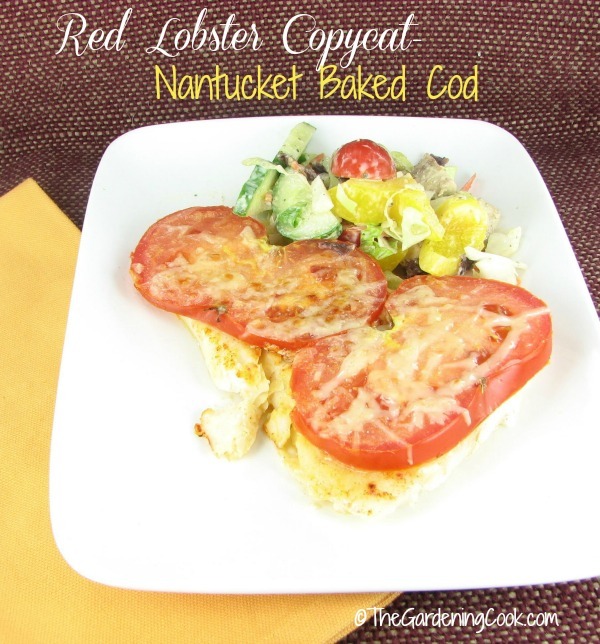 This copycat recipe shows an easy way to re-create Red Lobster’s Nantucket Baked Cod recipe at home with items that you most likely already have in your pantry. As nice as Red Lobster’s dishes are, they are also loaded in butter. This dish is slimmed down quite a bit but still has all of the flavor of the restaurant dish. At less than 200 calories a serving, it won’t hurt anyone’s dieting efforts! The dish is so simple to do. Just combine the spices, sprinkle the cod with the melted butter, lemon zest and lemon juice, add a couple of tomato slices and a sprinkling of fresh parmesan cheese. What could be easier. The fish does not need much butter and the lemon zest adds a nice tang. Just sprinkle with the easy mix of Kosher salt, cracked black pepper, cayenne pepper and paprika. Next add two slices of tomatoes to each cod fillet and sprinkle with freshly grated Parmesan cheese. 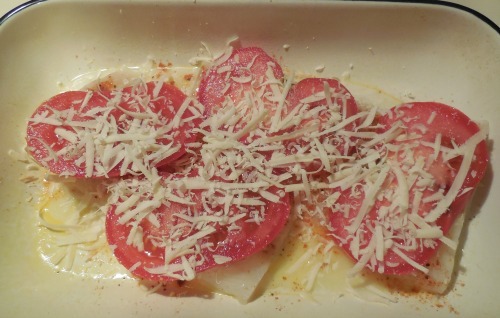 Bake in a preheated 425º oven for about 8 minutes, then turn the grill to broil and cook for another 6-8 minutes or until the cheese and tomatoes begin to brown. This delicious dish is ready in a flash. Perfect for busy weeknights when time is at a premium. No need to bring in Red Lobster take away. Make it at home! Preheat the oven to 425º. Combine all of the spices in a small bowl and set aside. 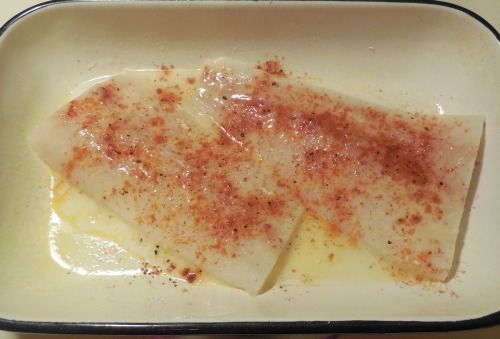 Place the cod fillets into an oven proof baking dish. Melt the butter in the microwave and brush over the fish. Sprinkle with the combined spice mix. Using a fine grater, grate the lemon zest over the fish, Add the lemon juice. 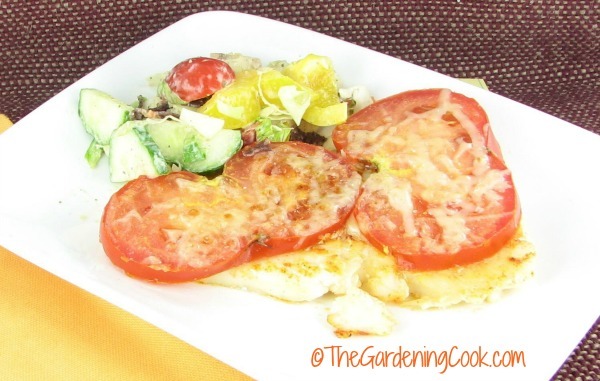 Cut the tomatoes into slices and layer two slices on each piece of fish. Bake the fish for 8 minutes, then turn on the broiler and cook another 6-8 minutes or until the cheese and tomatoes start to turn brown. Serve with salad and a baked potato. No need for Red Lobster takeaway! I’ve never eaten at Red Lobster, but this looks pretty good and really simple. I would probably substitute local haddock since I like that better than cod but otherwise I can see myself tying this recipe. Great job! A great recipe. I just made it for dinner for my husband and me. Thank you!